HomeSEO / SEMSearch Engine OptimizationVoice Search Optimisation; How can you optimise your website for voice queries? 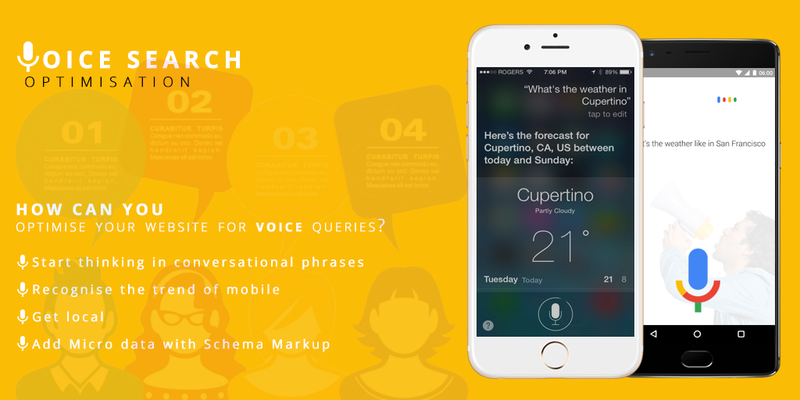 Voice Search Optimisation; How can you optimise your website for voice queries? Hello Siri, what is the temperature today? Hi Siri, where is the pizza restaurant nearby? Well, these are some common queries which are now asked vocally rather than typing. The time is changing and so does the definition of the common search query. Voice search feature has been activated in phones which allow you to speak with your device. You can now tell your device what to search for. Google has recently reported that 20% of mobile queries are voice searches and the ratio of voice search is growing faster than type search. No doubt, voice search has made searching things a lot easier. But do you know how this picking trend can do wonders for your website’s SEO too? It is simple. Start thinking in conversational phrases: The way we search using a keyboard is definitely different than the way we ask. Voice searches are more like regular conversation and come naturally. For example, if you happen to type on a keyboard, you would write what is the age of Donald Trump, what are the hobbies of Donald Trump, but, now if you ask same in voice then you would start using he or his in place of the name. The search engines now are working on it. They can now infer the meaning of placeholders words like he, she or it, based on previous queries. Now, one has to simply create a list of all the questions with who, what, where, when and why and answer them within your content in order to optimise for voice search. Recognise the trend of mobile: The shifting traffic from desktop to mobile makes it really important to optimise your sites for voice search. Maximum of voice search comes from mobile phone and considering this switching to responsive design for your website becomes a wise choice. Another factor which plays a big role is the loading speed of your page. Mobile users like the fast loading websites and search engines are weighing it also as a factor in filtering its results. Get local: Statistics show that the voice search is roughly three times more for the local results. These searches are more about for seeking the things ‘near me’ like medical shop, restaurant or salon. Asking for directions is incredibly common and now if you include directions to your store from some popular landmarks or major roads then the chances of someone finding your page increases. Think of all the possible questions someone in the neighbourhood might ask. Plot out the blog series or landing page to target these questions and finally optimise for higher traffic by putting your website on leading platforms like Facebook, Google Business, or LinkedIn. Add Micro data with Schema Markup: Search engines help with the voice search queries only till the extent they understand what you have provided them with. This calls to provide them with clear data to read. As search engines understand very specific information to provide to its users contextually, one has to really get their hands dirty technically. Voice search is more about ‘near by’ information and therefore search engines need to know your location correctly. To achieve this, you need to use proper HTML formatting, add micro data by way of schema markup as well as XML information to the extent you can manage and get the desired results.